Aikido is an ideal martial art for women. Not only does it rely on timing and leverage to power the throws rather than muscle, but aikido provides practical self-defense techniques. In aikido, women take turns attacking and throwing, experiencing physical conflict and resolution both. Aikido cannot be learned alone; women and men practice together and learn from each other, allowing women to deal with realistic sized attackers and learn the male perspective in conflict. Since success depends on observation, timing, and agility, Aikido helps women develop their strengths to their advantage. Read “Get Fit” by Lauren A. Golt, an article that appeared in the Wilmington News Journal which profiled one of our women students. 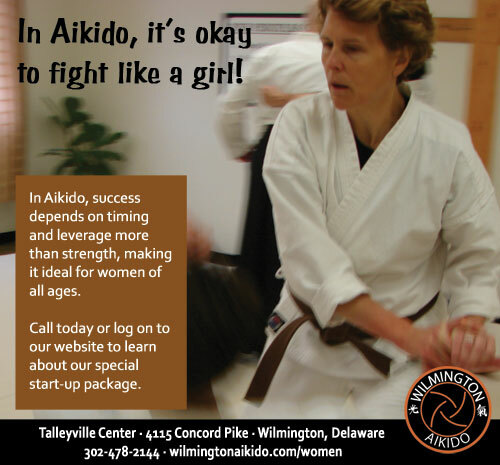 Read Aikido Training for Women by Wendy Harnwell, an article that appeared in the County Women’s Journal in 2008.